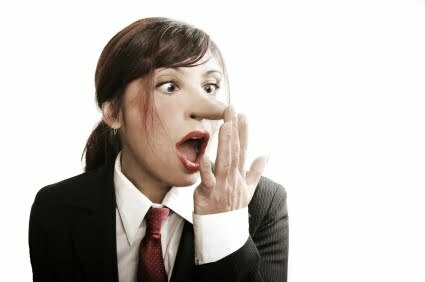 Studies have shown that lying and deception is a natural trait that is acted out in every person's life. According to mental health professionals, lying is viewed as a normal human trait that is silently accepted in our social make-up and personal interactions. On average, it has been documented that people begin telling lies around the age of 5 or 6 years old and continue on throughout adulthood. In fact, research has proven that most people will tell lies on a weekly or even daily basis without thought or conscience. In one particular research study at the University of Massachusetts, subjects wore a recording device for three days and went about their daily routines. At the end of the allotted time period, both researchers and subjects listened to the recorded interactions and tallied up the number of white lies that were told. What were their findings?... The subject's average rate of lies amounted to three lies for every ten minutes of conversation. Wow! That is a lot of deception. When confronted as to why they lied in their common day-to-day circumstances, the subject's reasons were as follows: (1) To avoid hurting another person's feelings; (2) To cover up their own embarrassment; (3) To improve their image in the eyes of others; (4) To reassure the needlessly anxious; and (5) To spare unnecessary headaches. It is undeniable. Lying is epidemic and endemic to mankind. Politicians lie to get elected, advertisers lie to sell products, and average, everyday people lie... well, because we can. In the words of a Time magazine essay, ours is "a huckstering, show-bizzy world, jangling with hype, hullabaloo, hooey, bull, baloney, and bamboozlement." So it comes as no shock that mankind's view of lying is considered a normal trait. It is what we are accustom to. In truth, it is normal coming from our nature... normal and sinful. Some of us lie incessantly to get our way. We do so with little concern for others and our motives are manipulative, cunning and self-centered. Some of us lie out of mere habit. It has become a reflex response where we bend the truth about everything, large and small, to best suit our agenda. Either way, as a people whose human nature is drenched in sinfulness, we find ourselves dripping in our own dishonesty everywhere we turn. Mankind is imprisoned to the act of telling, believing and accepting lies. It is no wonder that we have such a difficult time accepting the freedom of Christ and believing the Lord's word as true, righteous and just. Without the aid of a Savior to guide us, our tarnished reasoning cannot fathom the concept of a truly good God because we are surrounded in our own deceitfulness and false nature. But thankfully, God is not false. God is not deceitful. God is good... He is the only Way, the Truth, the Life. Satan continues to try everything he can to muddy our vision to God's absolute and unchanging word, but the truth about lying is this: Sin stems from lies. For sin is a transgression against God's divine and holy law - the guidelines that He created for us to live a full and healthy life in His presence. When Adam and Eve first sinned in the Garden of Eden, it was because they chose to follow the counsel of someone other than God. They listened to Satan, the Father of Lies, and believed his false guidelines for life. They took their eyes off their Maker. They followed a counterfeit "god" alternative that contrasted against God's one true and intended solution for how they were originally created to live. They walked away from a healthy, abundant life and loving relationship with their perfect, Almighty Father... a Father who wanted nothing but the best of everything for them. From then on, mankind has been cursed with sin and damned with the death that accompanies. Since then, the lies and warped obsession for false substitute gods have abounded. Without God, man is hopelessly drowning in lies... damaged and lost. Ladies, our Savior is able and willing to free us from the lies of this world. Jesus Christ wishes to teach us how to find true freedom and perfect peace in God's divine and holy law. Let's seek Him every day... every moment! Let's learn His ways - for His path alone is genuine and true. Let's follow His holy example so that we may live fully and healthy and whole in His presence forever.